There’s no stinkin’ possibility I could possibly count the ways. Instead, I’ll just show you the two current methods. 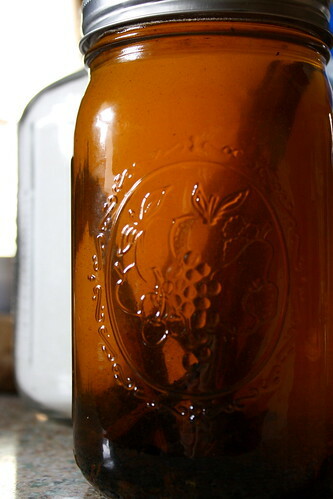 Homemade vanilla extract – I first read about this over at The Prairie Homestead. Thanks, Jill! This is seriously Easy Mode. Obtain vanilla beans (I got mine from Olive Nation – a place I plan to shop again.) 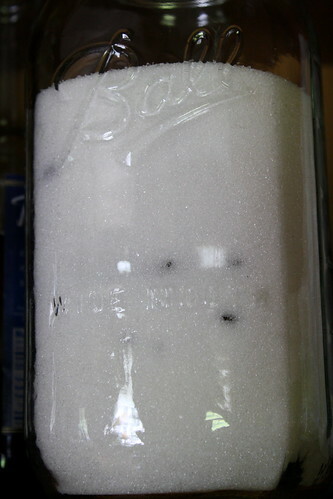 Obtain bottom-shelf, cheap vodka in a quantity sufficient for your purposes. I chose a gallon of 5 O’Clock – a depth to which I had never previously sunk in the booze aisle. But we don’t care! The nasty vodka flavor will be all wiped out by the amazing, intense vanilla beans. BOO-yah. Get your steeping vessel. I’m using a wide-mouthed, quart-sized Ball jar. Glass is preferred over plastic. Slice the vanilla beans lengthwise using a knife or kitchen shears, then cut them into short pieces to get more of the beans’ goodness exposed to the vodka. I left some their full lengths for aesthetic’s sake in the jar, but that’s just because I’m odd. If you’d like to take the time to carefully scrape out the innards and plunk them into the jar, so be it; however, they’ll work their ways loose over time, because we’re going to be shaking this jar frequently for months. Put all the vanilla bits into the jar, and top it off with vodka. Shake the living daylights out of it! Get all those magical seeds worked loose. This is very much not an instant gratification process. The extract is going to need to steep for anywhere from two to six months to attain full awesomeness. It’ll be worth it. As an added plus, when it reaches the desired level of HOLY VANILLA, you’ll pour off the extract, leave the beans behind, and then fill it back up with fresh vodka for another steep. The beans will release more goodness. It’ll take longer the second time, but we may as well get our money’s worth, right? And it’ll probably take awhile to use up that quart of extract, so we have plenty of time. Of course, you could use a smaller vessel – say, a pint or half-pint – to make your extract, too. It’ll still take awhile, but probably less time than the giant vat would. The amount of time it’ll take to steep will also depend upon how many beans you put inside; more beans = less waiting. I have somewhere between seven and ten beans in mine. Down the road, when you’re ready to use the extract, you can either strain out the seeds, but I’ll be leaving mine in. I love that delicate little “pop” from real vanilla bean seeds, followed by a short burst of “wowvanilla” flavor. For the first few weeks, I’ve read one should shake the jar every day, and then gradually less frequently as time goes by. I’ll shake mine whenever I happen to think about it, probably, because honestly, this is not rocket science. The vodka and beans will do their thing, with or without human intervention. Shaking the jar will speed things up a bit, but it is not absolutely required. The longer you let it steep, the more intense the vanilla flavor will be, so don’t freak out if you forget and leave it in your cupboard for a year before rediscovering it as you’re searching for the baking powder. It’s vodka – it’ll keep just fine, pretty much forever, and just get better and better over time. Believe it or not, this is even easier. I cut up three beans into quarters, layered them with plain old sugar in a half-gallon jar and am letting it sit for a month or so. The vanilla flavor will gradually infuse throughout the sugar, giving whatever I end up putting it into an extra vanilla kick. No shaking, just let it sit there. When the jar has a really nice, heady, vanilla aroma, it’s good to go. 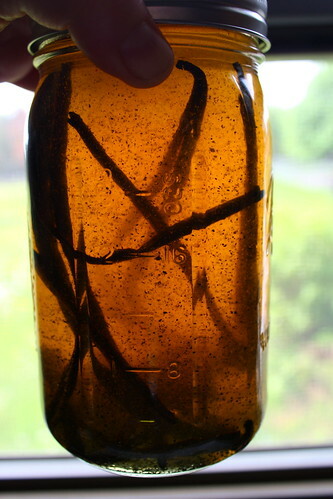 I now have a few dozen “extra” vanilla beans – what are some of your favorite vanilla recipes? I think I’m going to do a vanilla/coconut oil body lotion this afternoon. 4 responses to Vanilla; How do I love thee? Great post!! And your pics are way better than mine. 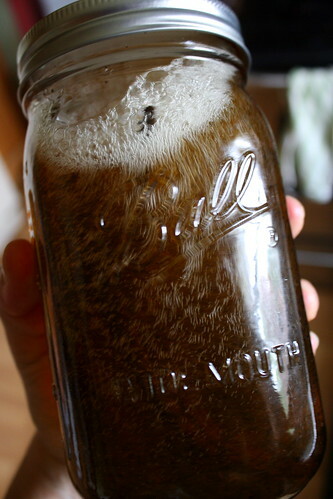 I made my vanilla extract look like dirty pond water, haha!! Thanks for reminding me about the vanilla sugar- been wanting to try that. I loooooove the taste of pure vanilla extract, but I use so much of it in baking and sauces that it become cost prohibitive to use it so I normally go for the cheap stuff. Now you’ve got me thinking I could make it myself! Question: Does it require a dark place to ferment? or can it be out in the light? Ohhhh, Benny – Vanillin is pretty much pure evil – it’s a by-product of paper milling, amongst other things. Hate to think of you putting that into your awesome self. If you start with a smaller jar (like a pint or a half-pint) and use more beans, you’ll have a usable end product more quickly.